"If the growth of Christianity had been arrested by some mortal malady, the world would have become Mithraic." Jacob's Dream by William Blake (1757-1827), watercolor print, 37 x 29 cm, completed 1805, on display at the British Museum, London. Blake, in the above painting, depicts his version of "Jacob's Dream" as described in the Book of Genesis, Chapter 28, Verses 11-19. 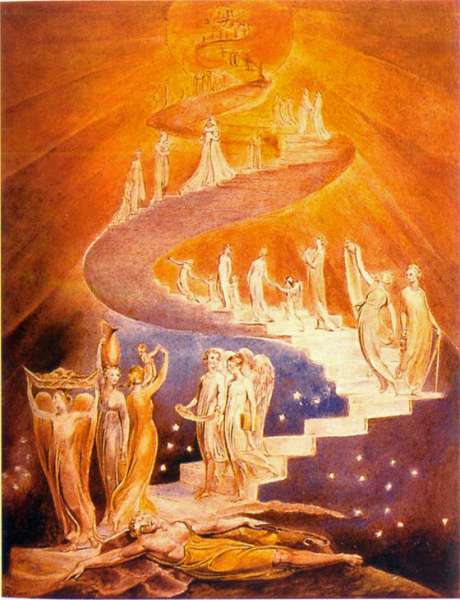 It is a ladder of many steps connecting Earth with Heaven. In the Jewish Kabbalah, which originated in the late Middle Ages, a seven step process is recognized and depicted in the "Tree of Life" diagram. 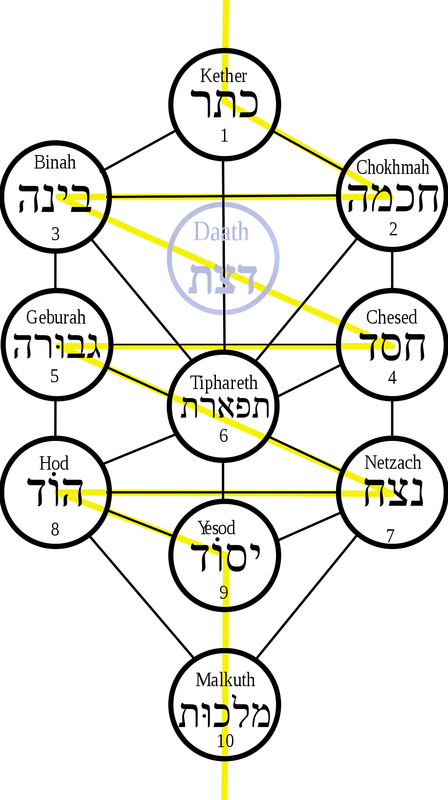 The Sephiroth depicted on the Kabbalistic Tree of Life (see diagram on the right) is a grouping of 10 "enumerations" or emanations through which the Jewish God (referred to as "Ein Sof" - The Infinite) reveals himself and continuously creates both the physical realm and the chain of higher metaphysical realms. The doctrine of the Sephiroth is the essence of the Kabbalah and distinguishes it from other forms of Jewish mysticism. The ten stage Sephiroth (in the singular each stage is called a Sephirah) are arranged in three columns of circles. The left column is called the Pillar of Severity. This represents the female side of man and contains three Sephirah: Binah (Understanding), Geburah (Severity) and Hod (Splendor). The right column is called the Pillar of Mercy. This represents the male side of man and also contains three Sephirah: Chokmah (Wisdom), Chesed (Kindness) and Netzach (Victory). The middle pillar is called the Pillar of Equilibrium and contains four Sephirah: Keter (Crown), Tipereth (Beauty, Yesod (Foundation) and Malkuth (Kingdom). An additional, eleventh Sephirah occasionally appears in some Tree of Life diagrams. This Sephirah, Daath (Abyss), is shown in the above diagram colored in light blue. Daath is considered to be the conscious manifestation of the first Sephirah (Kether), thus conserving the ten categories. The "zigzag" yellow line connecting all the spheres shows the pattern of descending emanations from "Ein Sof" down to the material world (Malkuth). Although there are ten Sephiroth, in three cases two Sephiroth are on the same level. Accordingly, the path of descent/ascent passes through only seven levels! This scheme is directly equivalent to the Platonic/Pythagorean and Mithraic ascent/descent through the seven planetary spheres! If you are a Fourth Way student, this scheme of ascent/descent is also analogous to the "Ray of Creation" (Cosmic Octave) described by P. D. Ouspensky in his book In Search of the Miraculous, chapters 7 and 8. The Ascent of the soul up to the Godhead would follow the same line of connections except in reverse. Spiritual ascent may be thought of as a movement through the worlds or levels of emanation in which the coverings of impurity that create distance from the Divine are progressively removed. The descriptive framework of emanation provides many images, metaphors, concepts and entities which can be utilized to create a program of ascent; that is, the process can be conceptualized in stages, and the spiritual aspirant attempts to work through these stages. More detailed information concerning these stages are outside the scope of this website; however, an excellent lecture by Colin Low entitled Emanation & Ascent in Hermetic Kabbalah is available online. However, it is from pagan sources, not Hebrew, that the 7 step process was originally derived. In many (but not all) alchemical belief systems, the full psychological transmutation system is accomplished in either 21 or 22 steps, i.e., 14 or 15 steps of descent and 7 steps of ascent. It is the 7 steps of ascent that tend to garner the most attention from the ancient treatises on the subject. 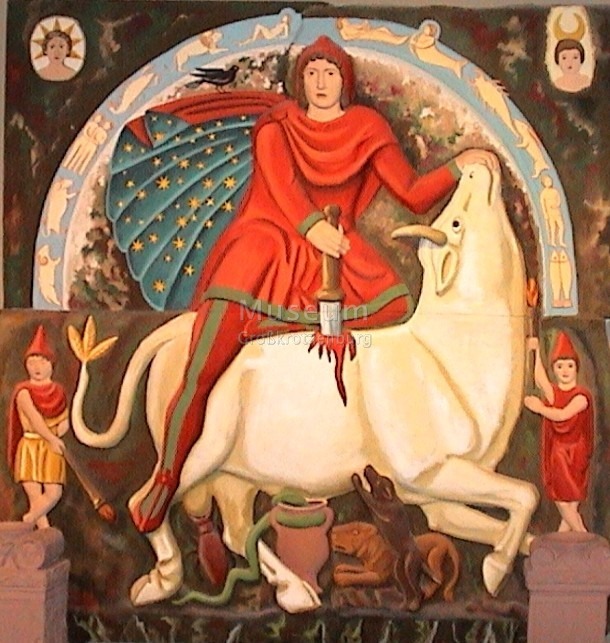 These things are obscurely hinted at in the accounts of the Persians, and especially in the mysteries of Mithras, which are celebrated amongst them. For in the latter there is a representation of the two heavenly revolutions,—of the movement, viz., of the fixed stars, and of that which take place among the planets, and of the passage of the soul through these. The representation is of the following nature: There is a ladder with lofty gates, and on the top of it an eighth gate. The first gate consists of lead, the second of tin, the third of copper, the fourth of iron, the fifth of a mixture of metals, the sixth of silver, and the seventh of gold. The first gate they assign to Saturn, indicating by the ‘lead’ the slowness of this star; the second to Venus, comparing her to the splendor and softness of tin; the third to Jupiter, being firm and solid; the fourth to Mercury, for both Mercury and iron are fit to endure all things, and are money-making and laborious; the fifth to Mars, because, being composed of a mixture of metals, it is varied and unequal; the sixth, of silver, to the Moon; the seventh, of gold, to the Sun,—thus imitating the different colors of the two latter.